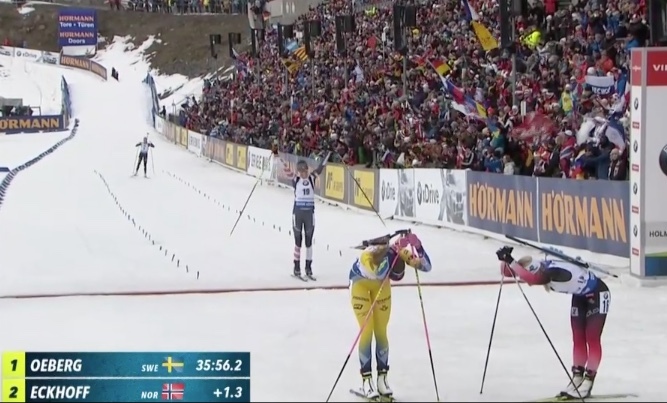 Love the Norwegian crowd at Holmenkollen. They know a solid performance when they see it. Regardless of team uniform, the cheers are exuberant when there’s a good show. With the curtain pulled up, the fourth shooting bout, prior to the final ski loop, was when the drama unfolded. 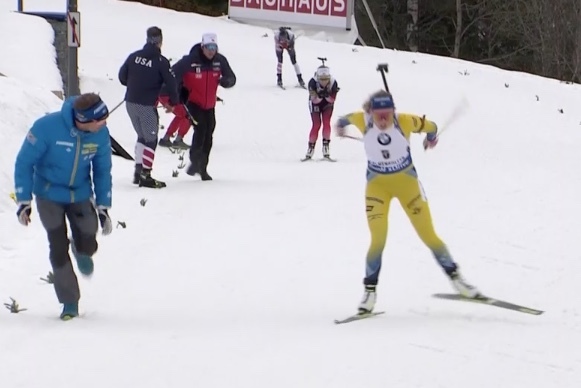 Up to that point, Sweden’s Hannah Öberg had missed a single shot after three shooting bouts, Norway’s Tiril Eckhoff had missed two, and Clare Egan of the U.S. had shot clean. That looks like 0+0+0 and can be a confidence booster on the range. Öberg slotted into shooting first with a 10.8 second lead on Eckhoff and a 17.5-second gap on Egan in third. As far as quiet on the range, the crowd was intermittently as loud as a late 70’s KISS concert in Madison Square Garden. Öberg missed a single shot. Eckhoff missed a target. As did Egan. Off the front in her canary yellow uniform, but within sight of Egan and Eckhoff as they left the stadium and began climbing the first punchy climb, was Öberg. As they skied up, Egan move to the pacing lead, sensing the opportunity at hand. It was a beautiful chase. The time splits only reinforced the theater. At 10.9 k, Egan came through 9.7 seconds back, Eckhoff 11.4. Those slim margins were holding as the Norwegian and U.S. athlete swapped leads: Eckhoff was 8.8 seconds back at 11.9 k, Egan 9.9. 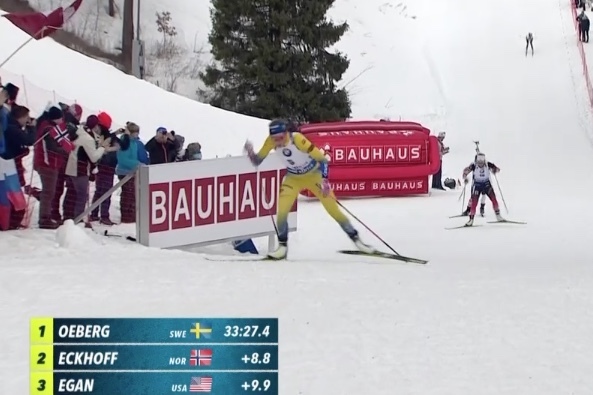 Öberg held firm skiing relaxed up front but knowing the hounds were chasing. Atop the hill after the 11.9 k time check, Eckhoff had gapped Egan by approximately 10 meters. The drama for the crowd was for the Norwegian chasing down the Swede. Into the final straight the real estate had closed down for Eckhoff as Öberg took the win in 35:56.2 minutes after shooting 0+0+1+1. Sweden’s Hannah Öberg heading through the 11.9 k checkpoint. (Photo: NBC Gold screenshot). 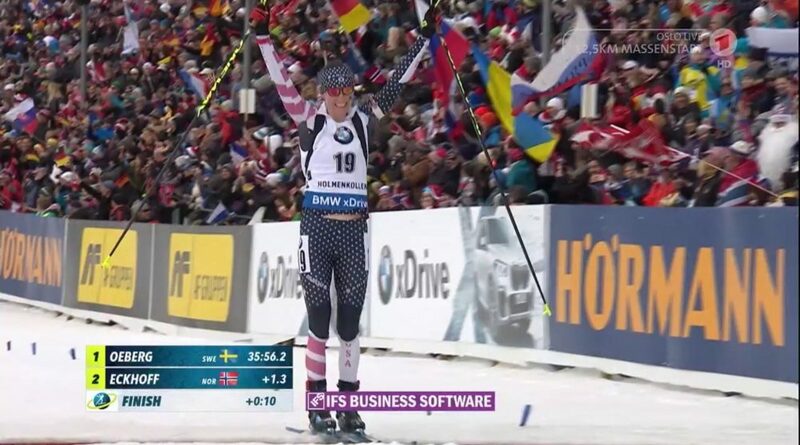 Eckhoff took second (+1.3, 0+0, Egan placed a career-best third (+10.4, 0+0+0+1) for her first IBU World Cup podium. Egan, who finds herself ranked 18th in the world, had considered retiring after last season. Thoughts of retiring have been put aside for Egan if her comments are an indication: “I am very excited for the next season,” Egan said.